CONCORD, N.C.—New rubber. Old rubber. It didn’t matter to Brad Keselowski, who ran the final 56 laps of Friday night’s Dollar General 300 NASCAR Nationwide Series race on his last set of tires. 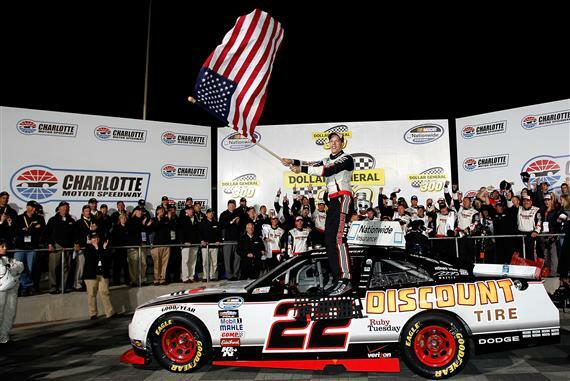 Track position, however, proved far more important at Charlotte Motor Speedway, where Keselowski picked up his first NASCAR Nationwide Series win at the 1.5-mile track, his fifth victory of the season and the 11th of his career. Martin Truex Jr. ran second, followed by Justin Allgaier, Joey Logano and polesitter Clint Bowyer, whose winning chances disappeared with a pit-road speeding penalty on his last stop. Kyle Busch, Reed Sorenson, Aric Almirola, Ryan Newman and Kevin Harvick completed the top 10. Keselowski widened his lead in the NASCAR Nationwide standings to 450 points over 13th-place finisher Carl Edwards. “I might be biased, but I thought that was the best race I’ve ever seen in my life,” said Keselowski, who has won two of the four races in the new NASCAR Nationwide car this year. “And I was driving the car, so I can imagine what the fans saw—that was awesome. “The decision to stay out … we had pitted just five laps before the yellow came out (on Lap 154) and felt really good about it. I knew that Paul (Wolfe), my crew chief, had made an adjustment right there at the end, on the last stop, and my car was just flying. Keselowski’s ploy to stay out on old tires after the caution on Lap 154 paid immediate dividends. The driver of the No. 22 Dodge opened a lead of almost a second over Truex before Brian Scott’s spin through the frontstretch grass caused the seventh caution of the race on Lap 182. On Lap 183, Harvick and Edwards pitted for fresh tires—from fifth and sixth, respectively—and restarted 11th and 12th on Lap 187, but the new tires failed to provide the desired advantage. The green-flag run was short-lived, however, as Steve Wallace turned across the nose of Trevor Bayne’s No. 17 Ford on Lap 188 and slammed into the backstretch wall. Keselowski led the field to a restart with eight laps remaining and pulled away to beat Truex to the finish line by 1.137 seconds. Notes: Danica Patrick posted a career-best 21st-place finish in her ninth NASCAR Nationwide start. … The Charlotte race was the fourth and final event with the NASCAR Nationwide Series new car this year, before it’s phased in full time in 2011.